This page contains dictionary definitions of ‘vegan’ available for free on the internet. Only unique definitions from their original source are included. Medical, etymology, and slang dictionaries are excluded. Related pages look at definitions offered by news media and animal advocates. My use of the term is unlike those here, but it's consistent with the history of veganism. Of the twenty one definitions: a] All outline a method of consuming products. b] None mention not participating in nonhuman exploitation more generally. c] Eleven only address dietary habits. Seven of these describe vegans as a type of vegetarian. d] Ten address conduct beyond food selections. Five of these suggest the non-food behaviors aren't essential to being a vegan. "A strict vegetarian; someone who eats no animal or dairy products at all." "A person who on principle abstains from all food of animal origin; a strict vegetarian." "A vegetarian who omits all animal products from the diet." "A vegetarian who does not eat any animal products, not even fish, eggs, or milk." "A vegetarian who eats no animal products." "Vegetarian who does not eat any animal products." "A strict vegetarian; someone who eats no animal or dairy products at all"
"Someone who does not eat any animal products at all, such as meat, fish, eggs, cheese, or milk." "Somebody who does not eat meat, fish, dairy products, or eggs." 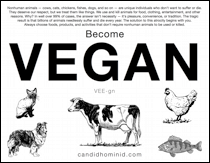 "Someone who chooses not to eat anything derived (=made) from animals or fish, including eggs, milk, and cheese." "One who abstains completely from the consumption of animal products, including meat, dairy products, and eggs." "A vegetarian who eats plant products only, especially one who uses no products derived from animals, as fur or leather." "A strict vegetarian who consumes no animal food or dairy products ; also : one who abstains from using animal products (as leather)." "Someone who does not eat meat, fish, dairy products or any foods containing animal fats or extracts, such as eggs, cheese and honey, often also avoiding using wool, leather and other animal-based substances." "A person who does not eat any animal products such as meat, milk or eggs. Some vegans do not use animal products such as silk or leather." "A person who does not eat or use any animal products, such as meat, fish, eggs, cheese or leather." "A person who does not consume, use or eat any animal products." "A person who does not eat or use animal products." "A person who refrains from using any animal product whatever for food, clothing, or any other purpose"
"A person who will not eat or use any type of animal product."